“Woo hoo! It's yardsale time! Wake up!” That was the call I got at 6am a few Saturdays ago from my sis. I had gone back to Virginia to visit my father who was being honored by having a football stadium named after him (it’s true). So I journeyed home to be a part of the festivities on a Friday night, and met up with my sister, Brecken, the next morning. ‘Yardsalein’ is a family tradition for us, one that’s been practiced since I was a small baby riding in a papoose on my mother’s back. Most of my childhood clothes came from yardales – every mother knows that growing boys wreak havoc on new clothes. Getting up with the sun on a hot sticky Saturday morning, grabbing a cup of tea and the local paper, and hitting the yardsales is just what you do in the hot southern summer. I was glad to be in the company of my sis, a pro-yardsaler who recently purchased a WWI era lithograph for $20 and had to drive it on the top of her car (it was framed, and measured 6ft long by 4ft wide) from Raleigh, NC, four hours home to Virginia. She found out later the print was valued at $2500, and it now adorns her bedroom wall. We hit the usual spots in the morning and then ventured further out into the country, browsing cardboard boxes while being watched by lackadaisical bovines standing three feet away behind relaxed wooden fences. As the sun started to rise along with the late August temps and the drone of cicadas started to match the drone in my aching head (too many celebratory lagers the night before), sis said “let's hit the one last spot.” As any great story goes, the last spot is always the jackpot. “The notes are printed in special shapes that help the reader fluently identify them on the musical scale. There are two prevalent systems, one using four shapes, and one using seven. In the four-shape system, each of the four shapes is connected to a particular syllable: fa, sol, la, and mi; and these syllables are employed in singing the notes. The shape for fa is a triangle, sol an oval, la a rectangle, and mi a diamond. In Sacred Harp singing, pitch is not absolute. The shapes and notes designate degrees of the scale, not particular pitches. Thus for a song in the key of C, fa designates C and F; for a song in G, fa designates G and C, and so on; hence it is called a moveable “do” system. When Sacred Harp singers begin a song, they normally start by singing it with the appropriate syllable for each pitch, using the shapes to guide them. For those in the group not yet familiar with the song, the shapes help with the task of sight reading. The process of reading through the song with the shapes also helps fix the notes in memory. 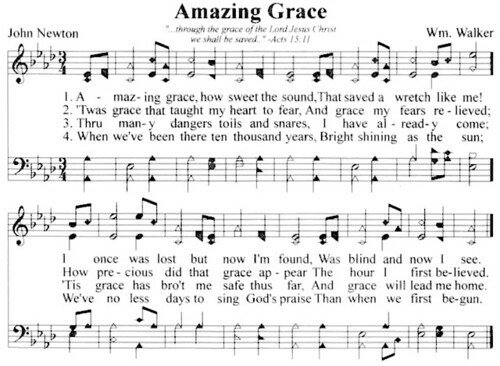 Once the shapes have been sung, the group then sings the verses of the song with their printed words." So, from that tiny little frayed yardsale hymnal, I was being introduce to an entirely new language. For a beginner, trying to understand this language is pretty damn confusing. However, as with any confusing thing, I’m very intrigued and have a strong desire to understand this new language. I’ve been scouring information online and watching YouTube videos, but my goal is to return to Virginia later in the fall and document, first hand, the real thing. Which gives me about two months to learn how to speak the language and not sound like a complete novice, even if that’s what I am. Some videos in the meantime! 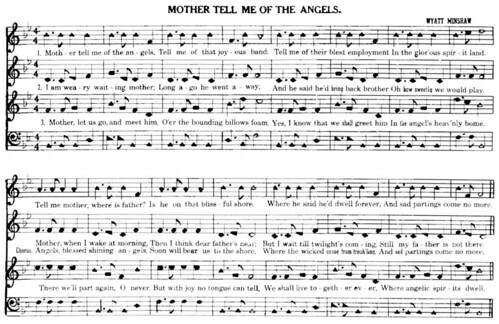 The video above illustrates the almost vaudevillian style of singing associated with shaped notes, while the video below is more similar to the standard full chorus style of singing. Click HERE for more on shaped note singing, and its history.